Those Beijing students were very young and full of ideals for the country. They could choose to enter into the existing system and benefit from it; however, during that summer day, they chose to shoulder the responsibility to overthrow profiteering, fight corruption, and promote democracy and freedom. I was at the monument at the square. Gunfire continued till morning at 4 o’clock; all the lights went out and there was complete darkness. Before long, the first batch of five to six CCP soldiers in camouflage uniforms rushed to the top of the monument and opened fire. The soldiers were about 3 to 4 meters away from me. The Beijing students used their bodies to shield me and pushed me to the bottom of the monument. They were in tears, and one of them said to me: “Yaoqiang, the Hong Kong people did a lot for us; you must go back alive and tell the whole world what has actually happened. Twenty-eight years have passed, but we have not forgotten. Apart from the annual candlelight vigil, I can still see the shadow of the 1989 pro-democracy movement. At my side now, there are countless lawyers in support of this fight for justice and countless social workers in support of the weak in society. Quietly, there are more teachers withstanding the pressure from schools in order to uphold and tell the truth to their students, there are even more reporters adhering to their standpoint to report the truth, and there are even more parents insisting on telling their children the truth lest they be deceived by the CCP’s lies. It’s been 28 years now, so some people choose to forget, some people choose to tell lies, some people could not care less, and some people choose to support the rich and powerful. 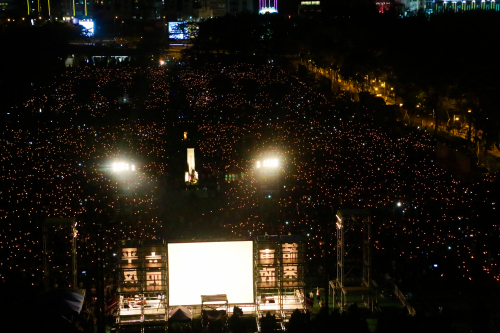 What I choose is to vindicate the truth of the June 4, 1989 pro-democracy movement.